Mindfulness is nothing but the active state of awareness of your surroundings such as sound, taste, smell, and your emotions. The practice of mindfulness has been around for centuries. However, mindfulness has enjoyed a gradual increase in popularity over the last few years. Several exercises were developed by ancient Hindu and Buddhist civilizations such as yoga, meditation, tai chi, and qigong focus on practicing mindfulness. However, people have also started to practice mindfulness outside of these conventional approaches. Whatever mindfulness exercise you perform, it will certainly result in remarkable benefits. Rumination is the habit of continuously focusing on negative events from your past, their causes, and consequences. Rumination is a danger to mental health as it can quickly escalate into a full-scale chronic depression. With the help of regular mindfulness practice, you can overcome the habit of negative overthinking. 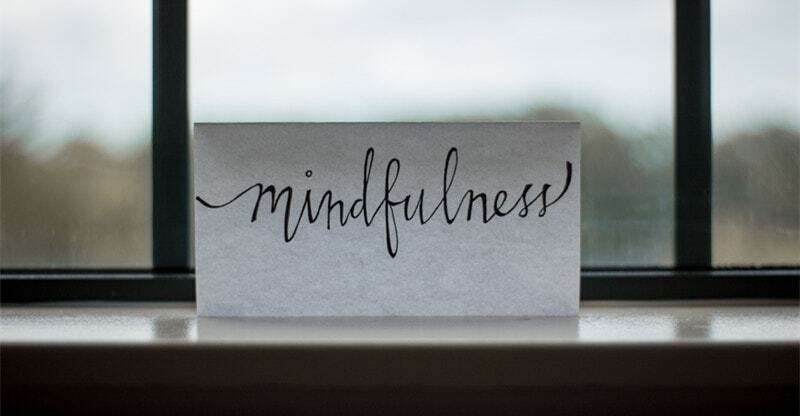 According to a new study published by a team of researchers from the University of Waterloo, the mindfulness practice can help stop mind wandering among individuals who tend to ruminate regularly. The study also found that mindfulness practices such as meditation could help people switch attention from the internal environment to the present surroundings. Most people start practicing mindfulness because they want to fight the generalized anxiety disorder characterized by excessive, uncontrollable, and unreasonable worrying about future events and actions. Dr. Elizabeth A. Hoge, an associate professor at Georgetown University, has demonstrated that learning mindfulness meditation results in a lower stress response in people with generalized anxiety disorder. The participants were asked on short notice to give a speech before an audience before and after they went through an eight-week stress management education course. The researchers monitored the blood-based stress hormone and inflammatory responses, and discovered that participants showed lower stress levels after going through the course. Several other scientific studies also have recorded findings that are consistent with these results. People often use the terms “empathy” and “compassion” interchangeably. However, they are distinctly different from one another. Empathy is the ability to share your feelings with others. On the other hand, compassion is the capacity to feel genuine concern for someone’s feelings. Compassionate people are usually motivated to help others, while empathetic ones can express their feelings in a non-obtrusive manner. Regular mindfulness teaches you to control your mood swings and learn to live with your emotions. The more you realize how emotions can blow a seemingly insignificant thing out of proportion, the better you learn to think empathetically and compassionately. In short, you learn to think from another person’s point of view rather than simply judging them. As a result, mindfulness helps improve your personal and professional relationships as well. People who struggle to express compassion and empathy often tend to be self-centered. They become self-absorbed, focusing solely on their primary needs. More often than not, this behavior leads to lying, stealing, and even hurting your loved ones to meet your immediate needs. Thus, self-absorbed people alienate their loved ones and end up destroying interpersonal relationships. Mindfulness, however, helps overcome self-centeredness as it increases empathy and compassion. It helps you focus on self-care instead of being self-centered, encouraging you to invest more time and energy into developing a matured perspective towards life. That’s why individuals practicing mindfulness are more likely to live a fulfilling and productive life. Cognitive flexibility is the ability to change your behavior according to the external environment. In other words, it is the ability to turn your attention from one task to another. One study found that practicing mindfulness helps an individual to improve cognitive flexibility, thereby developing greater intuitive understanding and awareness of your thinking processes. Mindfulness makes you “self-observant,” allowing you to focus your complete attention on the present thought. Whether you are bringing up a family, fighting off addiction, or trying to build a successful career in this increasingly volatile economy, life is full of uncertainties and difficulties. Irrespective of how hard you push, life will knock you over again and again. The bottom line is all of us have to go through tough times. However, mindfulness will help you see through life’s challenges from a rational point of view. With regular practice, you will start to grow emotionally, psychologically, and intellectually. Thus, mindfulness will improve your overall resilience. Eventually, you will learn to focus on your journey instead of worrying about the destination. Whether you are suffering from a medical condition such as Attention-Deficit Hyperactivity Disorder (ADHD) or not, it is often difficult to stay focused and productive throughout the day. In fact, with the emergence of social media, staying focused has become exceedingly difficult. Besides, the added pressure also leads to work-related stress and anxiety. However, as mentioned earlier, mindfulness helps you deal with anxiety and stress, increasing the ability of your mind to congregate on the task at hand. Mindfulness also programs your brain to suppress distracting information, making it more productive and sharp. In addition to cultivating positive work environments, several multinational companies have also started implementing mindfulness programs to increase productivity. Life is nothing but a series of boring activities. People often spend their lunch hour either staring at the cold lunch or eating sandwich after sandwich without taking their eyes off their phone. However, the moment you start practicing mindfulness, every seemingly mundane activity comes alive. Suddenly, you learn to savor every bite of that sandwich as you become aware of the taste, texture, and smell of the food. Mindfulness teaches you to intentionally cultivate interest in your daily activities to increase your curiosity and the happiness that comes from it. Chronic pain and illness can turn your life into a living hell. As the intensity of the physical pain increases, your mental anguish goes up as well. Whether you are sitting in a relaxed position or engaged in some activity, the pain never goes away. Though painkillers can reduce your pain up to a certain extent, it comes back with more stinging intensity than before. Besides, increased dependence on pain-killers can also lead to addiction. Fortunately, mindfulness has shown promising results when it comes to treating chronic pain. According to a small pilot study conducted at the Washington DC Veterans Affairs Medical Center, veterans who practiced mindfulness meditation experienced a 20 percent reduction in pain. “Our theory is that this process increases coping skills, which in turn can help veterans to self-manage their chronic pain,” said Dr. Thomas Nassif, lead author of the study. Everyone goes through a few nights of sleeplessness occasionally. However, when your sleep is disturbed for days or weeks, it will start to harm your overall health. According to the American Sleep Association, nearly 50-70 million US adults have a sleep disorder, with insomnia reported by about 30% of adults and chronic insomnia by 10% of adults. The feeling of daytime drowsiness makes you feel tired, procrastinated, and reduces your productivity. Several factors including growing work pressure, strained interpersonal relationships, and anxiety about financial security are responsible for disturbed sleep. Mindfulness can help improve your sleep in various ways. To begin with, it can take your mind away from unnecessary worry, reducing your stress and anxiety. With regular practice, you will become more aware of your thoughts and feelings, allowing you to understand your body’s physiological needs. The practice of mindfulness dates back to centuries. In recent years, scientific researchers have explored the various benefits of this age-old practice. From increased concentration to decreasing chronic pain, these benefits are particularly valuable in today’s stressful and demanding lifestyle.